Guess who finally made his way to the anxious, pining and adoring Queen City? 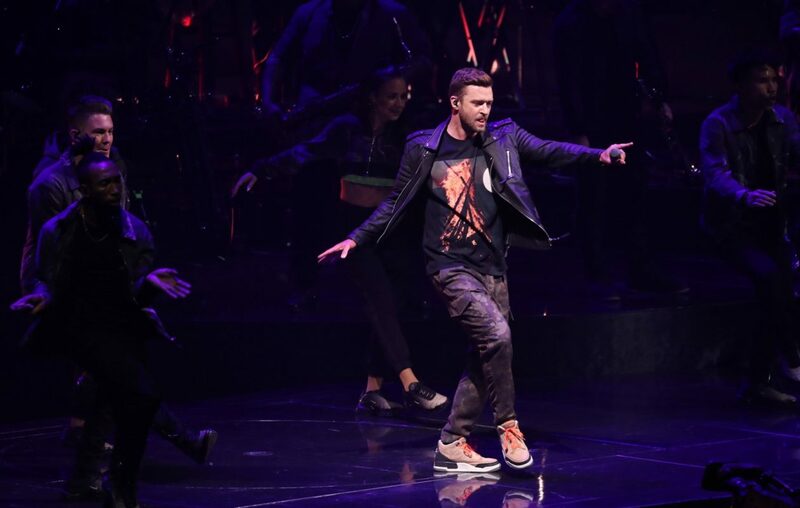 After two tour date postponements that were to have Justin Timberlake and backup band the Tennessee Kids rolling through Buffalo late last year promoting his release “Man of the Woods,” the entourage at long last played a nearly sold-out KeyBank Center on Saturday night. One of those breaks, between “Mirrors” and just before “Drink You Away,” (both from 2013) had JT passing out bright red shots for him and his bandmates. Someone (maybe that discreet assistant again) passed up the tray of drinks from the working bar amid the VIP section – this process took quite some time. While holding his shot aloft, JT offered up a thoughtful toast: “Here’s to the great State of New York, the great City of Buffalo. For some reason it takes me a while to get there but when I get here we throw down, don’t we? “Filthy,” lead track (and sexiest) off of “Man of the Woods,” had opened up the tight set with Timberlake emerging, as the band had just moments before him, down a back-lit runway that did conjure the optics of sci-fi. The vision of Timberlake dancing amid undulating laser lights on the central circular stage was gorgeous human-tech choreography. Sauntering into “Midnight Summer Jam,” Timberlake tossed in a brief phrase from “Super Freak,” a wry homage to funk forebear Rick James. Two by James, “Super Freak” and “Give It to Me Baby,” were featured in the second of two intra-band sets by emcee DJ Freestyle Steve, who also spent much time trying to locate “two best girlfriends” from an upper section, who he said he’d get into the VIP area. “Does Buffalo go hard?” The deafening roar told Timberlake that, yes, this city sure does. It was on to “LoveStoned,” and then the mega-fun of dance classic “SexyBack.” “Man of the Woods,” his swingy new-country number that apparently inspired a trio of girlfriends to come to the show in matching red and black flannel shirts (like Timberlake wears in the song’s video), led into “Higher Higher” and then “Señorita,” with the performer at the keys. The concert showcases optimum rock show tech recalling Cirque du Soleil logistics: Backup dancers and instruments emerge from trap doors; dozens of appearing and disappearing mesh video screens show multiple projected Timberlakes, forest imagery (tour theme); and the central and winding stage has an array of ramps and other amenities, like a real camp fire during “Until the End of Time,” bringing the multidimensional party as close as possible to everyone. “Cry Me a River,” early JT from his debut solo release, was one of the most visually arresting of the night with fog engulfing the stage and projected snowflakes/confetti floating downward. High-energy closer “Can’t Stop the Feeling” had Timberlake just where he started, on the stage’s ramp, a solitary figure backlighted, bowing deeply in all directions to his loyal and patient fans. Toronto-born artist Francesco Yates – singer, jangly dancer and casual guitar player – and band performed after Freestyle Steve’s first raucous set of dance-floor hits from the ’80s and ’90s. The half-hour of originals and covers, including Bruno Mars’ “Finesse,” and the hit that’s making his name, “Sugar,” was a peppy opener for the anticipated main attraction.